Chef’s Art range of Solutions are exclusively designed for chefs, with chefs. Inspired from International & Indian flavor profiles, our solutions have helped many kitchens transform menu & operations across all their culinary delights.The Chef’s Art portfolio offers a broad range of solutions including Marinades, Coatings, Sprinklers, Batter mixes, Sauce bases, Soup bases,Pre-mixes, Spices and many more solutions. 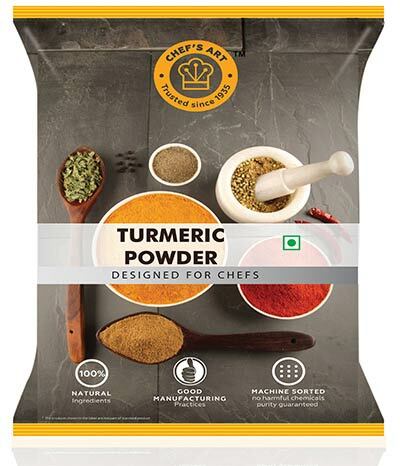 Chef's Art Turmeric, high on cucurmin is sourced from Tamil Nadu, adds yellow colour and astringent taste to your dish. We use Food Service India's Aromatic mix powder extensively and are happy with its quality and taste. The Spicy Grill marinade has the right combination of spices and flavors and has helped us to create high-selling dishes. We have been using Food Service India's products for last two years. Their seasonings and demi glace sauce are well received by our diners. Thanks to the team!